This photograph was taken in 1890 by photographer Edward Lackland who lived in Waterview Road, and is published here courtesy of the Devonport Museum. The area where Ngataringa Tennis Club now stands is to the right of the grazing horse. Ngataringa is the Maori name for the area now known as Stanley Bay, Stanley Point and Ngataringa Bay. Nga taringa means ‘the ears’ and the area is thought to have been a listening post and look-out in pre-European times. From here, waka could be heard approaching from all directions on Waitemata Harbour, and weather changes could be forecast. Until the late 1800s, Stanley Bay was known to European settlers as Brick Bay. The area was renamed Stanley Point in 1900 in honour of Captain Edward Stanley of HMS Calliope. The name Brick Bay came from a brick works, established at the base of the cliffs where Stanley Bay wharf now stands. Part of the old clay diggings are still visible at the foot of the cliff. 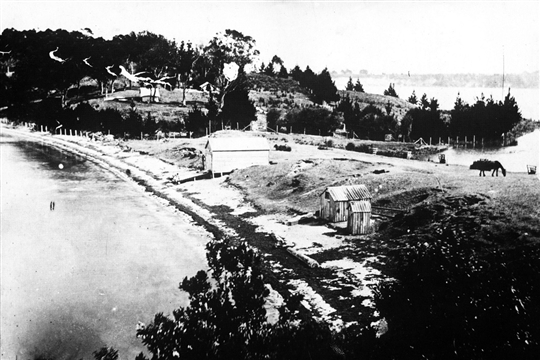 In 1895 a proposal to build a timber mill at Stanley Bay was defeated by protesting residents. At the time this photograph was taken, the whole area was owned by the O’Neill family, who also owned O’Neill’s Point at Bayswater. In 1895 the family sold part of Stanley Point to a Dr Franklyn, who built a large house overlooking the harbour and Auckland city. In 1899, this house was moved to Devonport, after being lowered down the cliff and floated down-harbour on barrels. The water supply for these early settlers was taken from a spring at the base of the cliffs below where Devon Park apartments are today. Kauri once covered the whole area, and the small whare (huts) in the photograph were used by itinerant gum-diggers who dug gum long-buried after the demise of the kauri forests that once covered the whole area. The large shed in the foreground was used as a boat shed but was once part of the brick works owned by a Mr Hammond, and established as early as 1844. The part of Ngataringa Bay to the right of the photograph past the grazing horse is now the home of the Ngataringa Tennis Club. In 1924, a group of residents from the Stanley Bay area formed the Stanley Bay Improvement Association. The group included Rewa Worrall, whose family has had a long history with Ngataringa Tennis Club. The association was concerned by a lack of playing fields, and they wanted a tennis club as a social centre. They developed the motto “If you want things done do it yourself, but get all the help you can”. On July 14 1924, a public meeting was called and it was proposed to raise a loan of 3,000 pounds to lift the level of the mudflats opposite the beach. With co-operation from the council, a special rate was levied on the ratepayers from Stanley Point to William Bond St, at an average cost of 14 shillings per year for 10 years. The work went ahead, and the in-filled land became Stanley Bay Park. In August 1927, the Club gave 100 pounds to the Devonport Borough Council so the Council could apply for a pound-for-pound Government subsidy to establish courts on the newly-created land. The Committee accepted from the then Mayor of Devonport, Mr E. Aldridge, the offer of a “hut” from the Stanley Bay wharf as a temporary shelter. Demolition timber from the old Devonport Fire Alarm Towers was brought in to create a temporary pavilion. Timber from the old Stanley Bay Wharf was used to build seating. A further 150 pounds was donated to the Devonport Borough Council’s ‘Relief of Unemployment Fund’ on the understanding the money be spent on the courts. The club was officially opened by Mayor Aldridge on 26 November, 1927. Guests included Mr L. Swann, secretary of the Auckland Lawn Tennis Association, who congratulated the Club on its “quick leap into existence”. The Club boasted five new chip/grit courts and the temporary pavilion. In 1929, our wonderful Clubhouse opened, with its upstairs lounge good for parties and dancing. (This is the same clubhouse, with some improvements, that members enjoy today.) The men’s locker room was accessible from outside, so that after-match refreshments were readily available. Some of these lockers have been recycled into a bank of cupboards in the storage area. The war years saw a decline in the Club’s fortunes with many members involved in the war effort. However, a few members kept the Club going through the 50’s and early 60’s. At some stage during the early years, the courts were converted to asphalt, and of course fundraising was a constant commitment with resurfacing needing to be done every five or six years to prevent cracking, and puddling. In 1968, Jack Colclough became President and resolved to reinvigorate the Club. Jack worked the members hard with fundraising to install drainage behind the Clubhouse, repairing fences, and resealing the courts. During this era, a strong Junior club was established by Eva Light and Joyce Stevens, and then joined by Eileen Slark and Noel Jonkers. Together they ran the juniors for about twelve years. There were large numbers of children divided into two sessions. Later, Maureen Nute and Toni Green ran a Wednesday after- school group to cater for young beginners, to relieve some of the pressure. George Glyde presided over our 50th Jubilee – a grand celebration dinner and dance held at the Rugby Club. George later helped to found the North Shore Veterans’ Association. The 1970s and 1980s saw the Club in a healthy state, with good representation at all levels of interclub, and a steady increase in membership, particularly Midweek Ladies. In the mid-80s we had a Midweek “Laddy” by the name of Geoff Sutherland, who told us about the merits of Astrograss. As a result of this, Dianne Hale (then Treasurer), Mike Leyden (then President), and Geoff set the wheels in motion for the Astrograss and Lights project, which was going to cost $87,000. Dianne put together a financial plan of five year debentures costing $800 and 1/2 debentures of $400. The Club secured a bank loan at 22% interest (the going rate at that time) and a top up from Tennis NZ. With the money in place the project went ahead, and members marvelled at how much longer balls and shoes lasted. The courts were now locked to casual players, and as a result the membership grew. Evening club time was established and proved popular winter and summer, rain or shine. With good stewardship under Mike Leyden followed by Marvyn Allan, the loans and debentures were paid off and it was time to renovate the Clubhouse. President John O’Toole and committee accepted plans by local architect Bruce MacFarlane, and signed contracts to modernise the building, and make it more user-friendly with larger windows and a new viewing deck. Stan Pearson took over as President, and careful management saw the club with a stable membership. Good financial planning allowed the club to keep up with maintenance, new fencing on two sides, and relaying courts 1 and 2. During this period, planning and steady accumulation of funds began for some larger maintenance items the Committee believed would be required in the future. Stan Pearson and John O’Toole (now our Honorary Solicitor) also worked hard to get our lease renewed without the Council putting in a “market rates” clause into the agreement following local government amalgamation. After 11 years of correspondence and meetings on the subject, this issue was resolved to our satisfaction and all parties finally signed off on the lease in October 2001. The unofficial Monday night Men’s evening was started by Gary Sugden during this period – and is still going strong today. David Aitken took over as President. The Club’s 75th Jubilee was celebrated with a special dinner at Duders, on the Devonport waterfront, on September 8 2002. Allen Foster was magnificent as master of ceremonies, leading the evening through a series of speeches, recollections, poems, the cutting of the Jubilee Cake, and the President awarding gold shoe-tags to each of the life members present on the evening. Following the formal part of the evening, a party took place with the band “About Time”, and an excellent time was had by all. The Jubilee dinner was followed by a Whites & Wooden Racquets 1927-style tournament held in brilliant sunshine the following day, with a great turnout for both occasions. Many people had gone to the trouble of wearing period costume, or wearing their commemorative 75th Jubilee shirts, turning back of the clock to our original Opening Day. Trying to play a decent game of tennis with an old wooden racquet was challenging! In 2002 we introduced our “first Wednesday of the month” social drinks (and tennis) evening, which is still running today. A number of major projects were completed during this time. The first being to upgrade/replace the court lighting system (including two new poles between Courts 1 & 2), and the resurfacing of Courts 3, 4 and 5. The Club received a grant from ASB Trusts for 50% of the cost of this $90,000+ project, which was completed in the Spring of 2002. In 2002/3 we fixed the serious problem of stormwater accumulating as a “swimming pool” under the Clubhouse, and got the NTC monogram shield made and put up on the Clubhouse exterior. In 2003/4 we completed our new, widened, volley wall, paid for by North Shore City Council (a large pohutukawa branch had crashed on to the old wall and partially collapsed it). We received a Grant from Lion Foundation towards a new upstairs kitchen, part of a renovation of the upstairs area of the Clubhouse. This was completed in 2004/5 and saw the introduction of a new colour scheme. In September of 2004 we introduced a new branding/identity Club logo. In 2005/6 we received a Grant of $17,500 from ASB Trusts towards the restoration/painting of the outside of the Clubhouse, replacement of the roofing iron, and replacement of the main electrical distribution board. In 2006/7 planning began for the downstairs refurbishment, and we now have an architect’s CAD drawing as a proposal to consider. Early in 2007 the Club signed a 10+1 year lease on the derelict ex-Girl Guide building, which is now our Junior Clubhouse. Broken windows were replaced, and the North Shore City Council funded the replacement of the roof, guttering, and downpipes at their cost. In July 2007, John Hunter was appointed as Director of Coaching, and he announced the formation of the Ngataringa Tennis Academy – a new identity for our overall Coaching programme. In 2008, with Philip Brown installed as President, Vicki Wild took over the running of NTA with Jim Widdowson and continued the work begun by John Hunter. In 2009, Jim departed for Australia was replaced by Justin Phillips. 2008-2011 Richard Loseby became President and embarked on a programme of refurbishment and renovation of the downstairs clubhouse and resurfacing of courts 1 & 2. Given the tight economic situation and the lack of funding from usual sources, this programme completed gradually by the end of 2010. Peter Restall was elected President in 2011, having served as men's club captain for several years prior and being an active member since the early 1980s. Following an association of several years and having built up a particularly strong Junior programme, the coaching was transitioned from Vicky Wild to Gilles de Gouy. Gilles set up Tennis Plus NZ and enlisted the help of several coaches and assistants – and competitive tennis has continued to thrive under their guidance. For the first time in the Club’s history, we had the strength to have two Chelsea Cup teams. Gilles led by example winning the Men’s Singles over 40 year olds National Title in 2012, and was selected to represent the Pacific Davis Cup team. The Men’s Singles Club Championships tournament was split into 2 divisions (S7). Peter sponsored the Tennis Plus schools programme by funding flyers, and continues to do so after his presidency, and also financially assisted the Chelsea Cup team with affiliation fee payments. The initial transition period during the change of coaching and change of season in 2011/12 saw a loss of 110 members. With a renewed focus on Juniors and Social activities, the consolidation of the new Tennis Plus coaching, and a concentrated “drop” of information brochures (hand-delivered by Committee and Club members) to households, our membership numbers re-established themselves. Wednesday night Club night was frequently well-attended, with occasions of 40 members turning up, half on and half off! Significant maintenance projects included a replacement of the Clubhouse upstairs balcony and internal stairwell rails (which no longer met the latest building code) with a stainless steel rail/wire system - which was affordable, legal, safe, and looks great without obstructing the view of the courts. $40,000 was spent on new astroturf for Courts 1 & 2, but this was marred by poor workmanship by Tiger Turf, which necessitated involving David Frank (CEO Tennis Northern, and our honorary solicitor John O’Toole). This ended in remedial work, grooming and a small financial contribution as a satisfactory resolution. The focus after that was to consolidate our funds to cover the much-needed replacement of astro on Courts 3,4 & 5. As such the electronic keyless entry system was put on hold, as was the replacement mesh fencing on the 50% not done. Funding of $75,000 was sought from ASB but declined due to our high socio-economic area and funds in the bank. Quotes received from 3 contractors including Super Turf to consolidate our base course foundation which sits on asphalt on reclaimed tidal land together with a full drainage system. Council had voiced via Tennis Northern they wanted multi-sport options to be made available on land they owned, however we retained tennis exclusivity, including the Junior Clubhouse, and successfully renewed our lease with Auckland Council in 2013 for a further 10 years.